Since taking Jo Boaler’s course, “How to Learn Math,” I continually think about how I can effectively gauge my student’s mindset at the beginning of the school year. 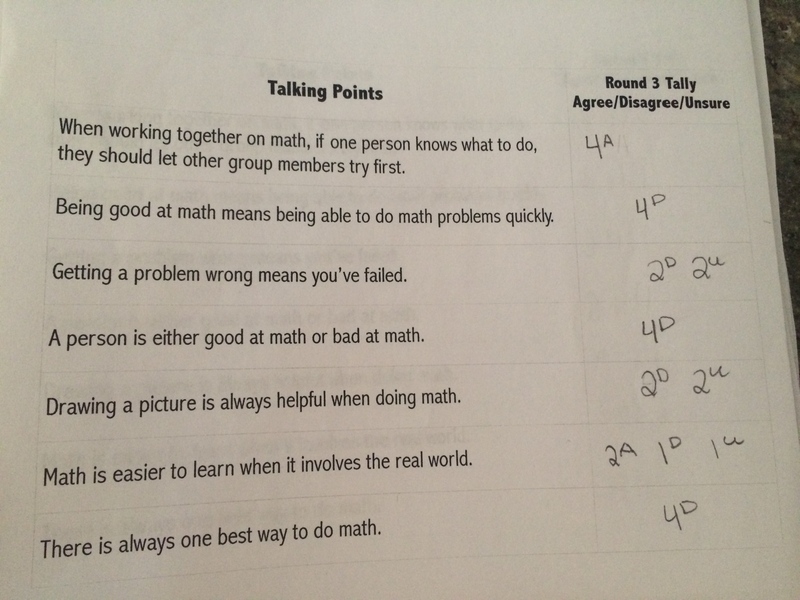 Last year, I tried a “Get to know you” form that students completed, asking questions such as: What do you feel you are really good at in math? 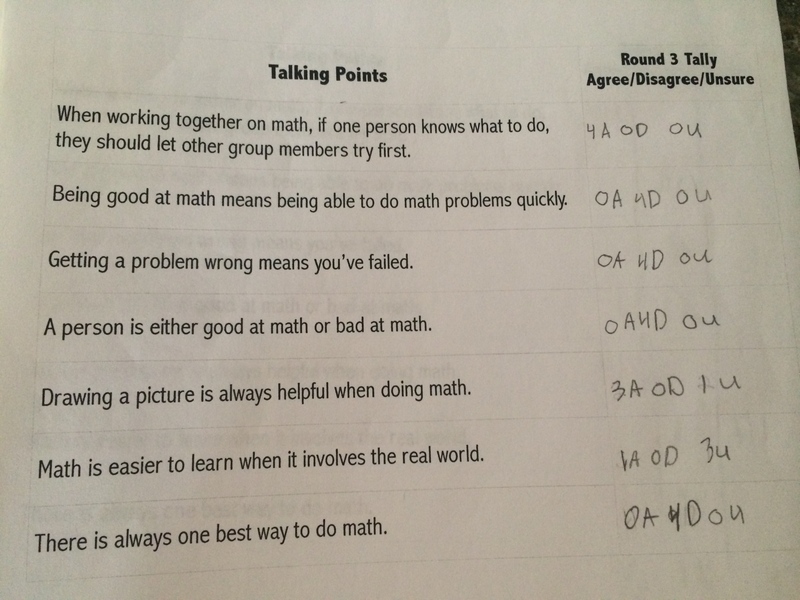 What do you feel you struggle with in math? Do you think you can get better at those things? etc… I didn’t feel like I got the type of insight I was looking for…partly because my questions weren’t that great and also because most students saw it as an assignment to complete and didn’t write out extremely involved answers that gave me much insight. I then took it upon myself to have inspiring growth mindset posters hanging up around the room and continually told students how mistakes help our brain grow, mistakes are good, no one is “good” or “bad” at math and all of those great things I learned! Don’t get me wrong, I love those things and will continue to do them, however it just didn’t feel like the thoughts came out organically….I felt I was trying to “teach” them how to have a growth mindset, if that makes any sense? 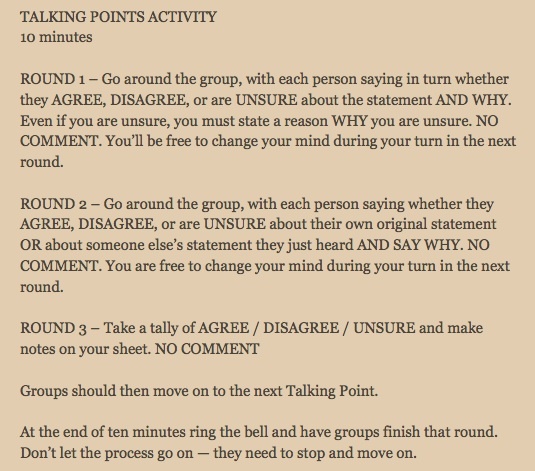 Now, Year Two after the course, and I have found (borrowed/stole) the BEST activity to get to know student’s mindsets at the beginning of the year, called Talking Points. I blogged about them before in my Week One planning post, but I had no idea at that point how much I would LOVE them. If you haven’t heard of them before check out @cheesemonkeySF on Twitter and her blog! 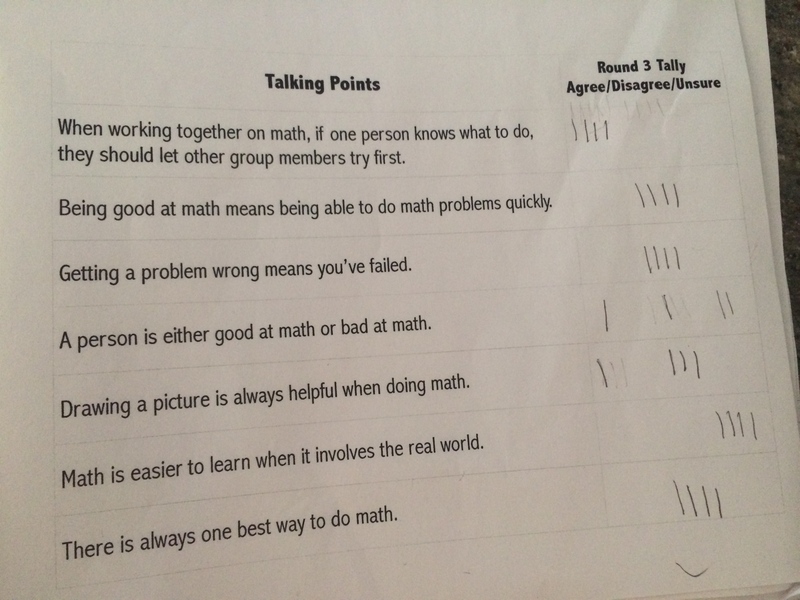 She adapted this activity from Lyn Dawes’ Talking Points activity… Amazing Stuff! On Getting a Problem Wrong Means You Are a Failure…. There is a group assessment piece that we did not have time for that day but we did do a classroom debrief so all of the groups could hear the conversations, it gave me goosebumps hearing them talk….awesome. I learned SO much about my students from this activity and it felt so organic coming from them. I didn’t feel like it was trying to “teach” them to have a growth mindset, it was coming from them! Love. Love. Love. Here are some of their tallies….I think this data is invaluable! I cannot wait to incorporate this routine into my math class this year! 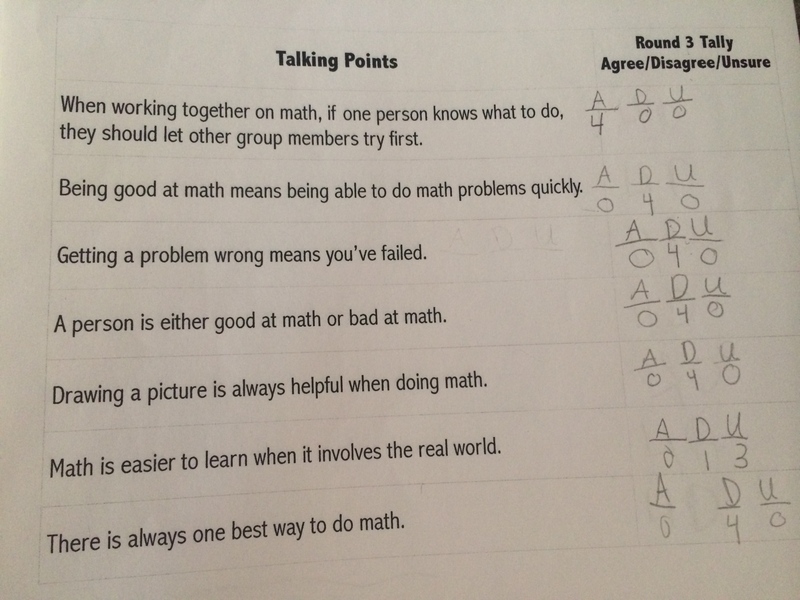 This entry was posted in Math, Mindset on September 6, 2014 by mathmindsblog. Hi there! I am planning on doing this lesson for my first day with the students tomorrow! 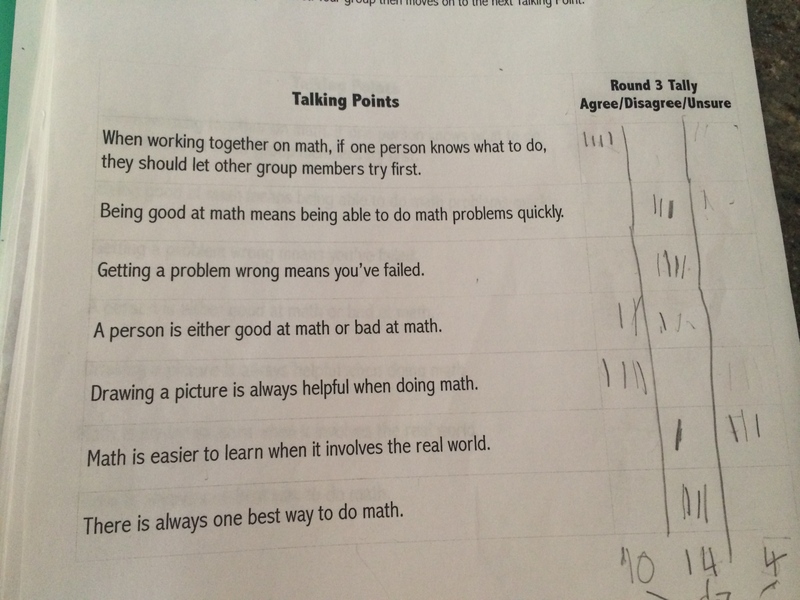 My question is, what do you do once the students have finished tallying all their talking points questions? Do you take a grand tally? 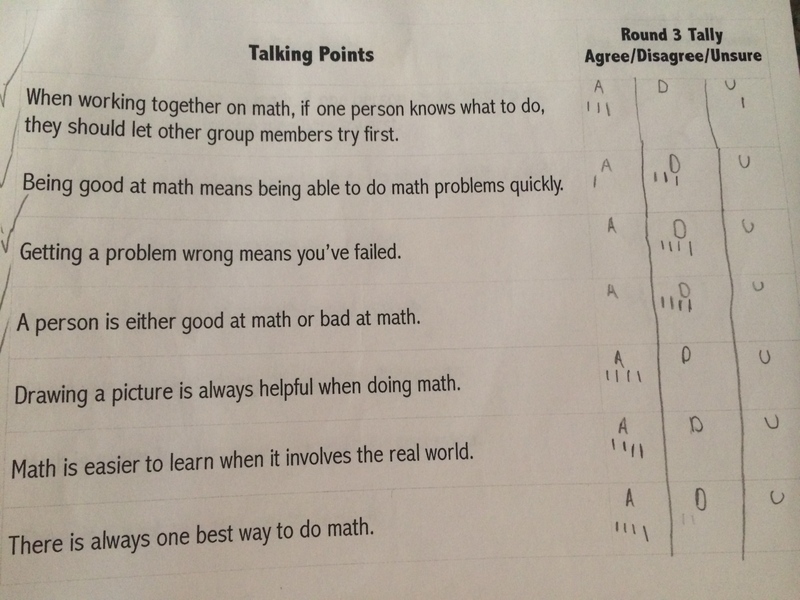 Do you have a discussion whole-group or just move on? Hi Ariana! 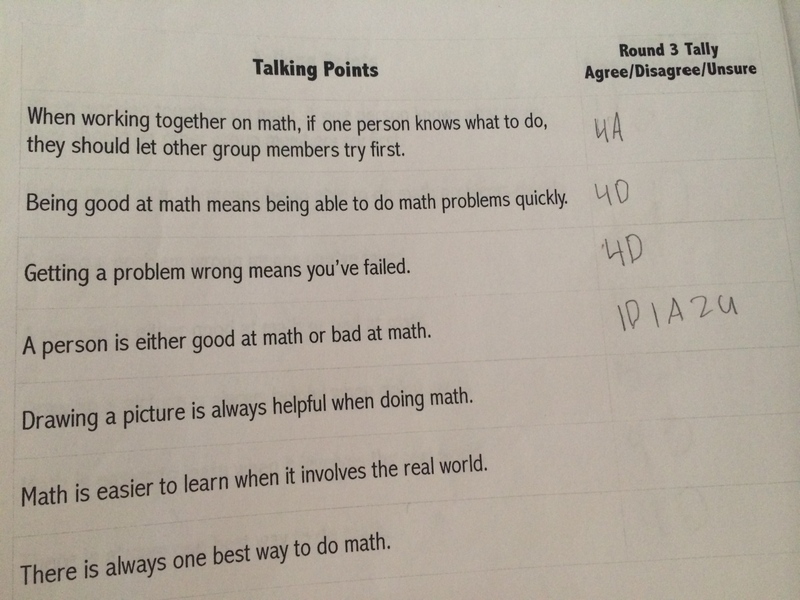 So excited to hear you are using Talking Points! I do a quick raise of hands for who A/D/U for each talking point and then we have a discussion. 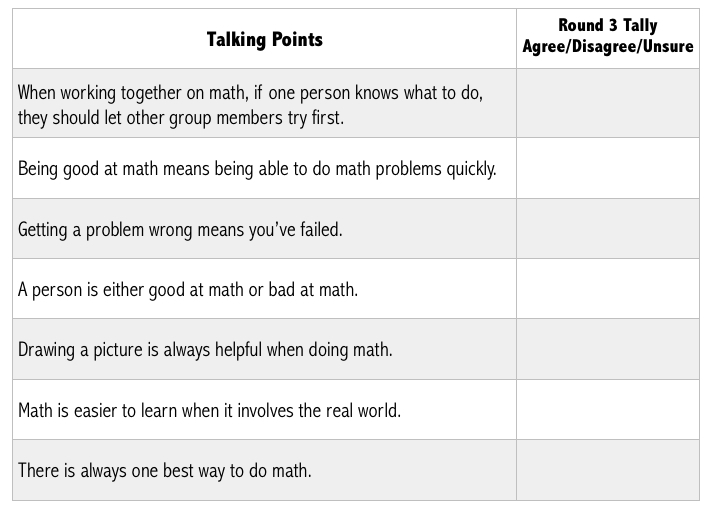 The whole group discussion goes quickly for the points where everyone agrees or disagrees but the ones where people are split I spend more time talking about it! I cannot wait to hear how it goes!! Please come back and let me know!! Pingback: La veille de la première journée…1st day is tomorrow | Les mathématiques, ma passion…l'enseignement, ma vocation!